PayPal keeps swinging! Is it time for Breakout? When a stock market is in a rally as a current one, the good stocks outperform the market and the bad stocks are dumped in favor of good stocks. The investors re-balance their portfolios. This is a quite natural activity of the stock market. One of the good stocks is also PayPal Holdings, Inc. (PYPL) which has been rolling the stock market and managed to triple its value within the last three years. 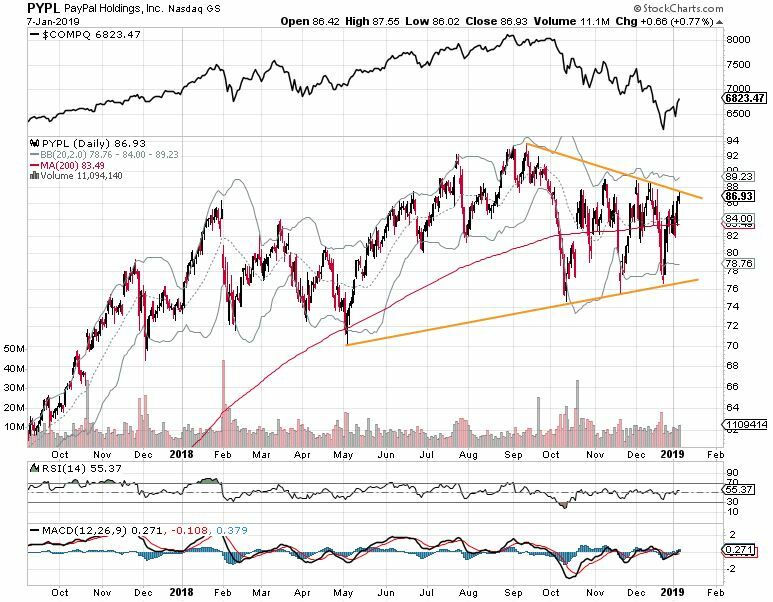 When Nasdaq together with the other indexes started to wobble and fall during 2018, PayPal always managed to hold its support, while forming a symmetrical triangle pattern. Below orange lines are clearly showing a trading channel that a price has determined using the powers of bulls and bears. If a current market rally is real, then PayPal is going to break out and if PayPal breaks out, then the stock is going to fly. 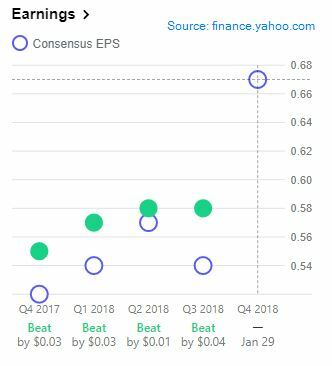 The company has been beating earnings estimates every time in a row and the next consensus is significantly higher than figures from the past. This is going to pure a lot of fuel into to stock rise. PayPal is releasing the results at the end of January and thus, the best tactic to profit well and quickly is going long on the breakout and selling it before the earnings release. Why? Even though the company beats the earnings again, it may decrease their profit forecast in the future. The overall economic overview is questionable at the moment due to inflation, quantitative tightening, and trade war. Hence, the stock market is quite uncertain and even strong companies’ stock price such as Apple’s is turning down due to weaker future forecast. Swing traders, active day traders and those with higher risk appetite may advantage from this stock even if the market does not recover, the current triangle setup of PayPal holds strong support and resistance levels with a wide range and thus, the price can be driven clearly inside the pattern. PreviousPrevious post:Marijuana Stocks Bottomed – This Chart Proves ItNextNext post:Real Market Rally or Christmas Fling?